MONMOUTH JUNCTION, N.J. – The Pointe at Turnbury, the active adult community five miles outside of downtown Princeton, will host an open house this weekend, May 4 and 5, from noon to 4 p.m. to celebrate the launch of a new phase of homes. As part of the celebration, developer Millennium Homes has extended one if its most generous offers to date: $20,000 in incentives on select homes. The $20,000 offer has been extended until May 31, but since the offer only applies to select homes, supplies are limited. Active adult home buyers can make sure they take advantage of the $20,000 offer by attending the open house. Refreshments will be served and tours of the community will be offered. 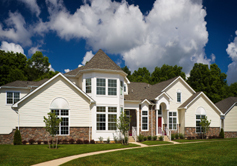 The $20,000 incentive can be applied to any finish upgrades offered at The Pointe at Turnbury. Popular choices include hardwood floors, granite countertops and numerous cabinet, faucet, crown molding and trim packages. In a community already known for its outstanding value, with luxurious homes priced from the low $300,000s, this is a rare opportunity for buyers to enhance their lifestyle and the value of their home at no additional cost. Located in South Brunswick, which was recently named one of Money magazine’s “Best Places to Live”, The Pointe at Turnbury offers residents the ability to own a private home in a community with friendly neighbors, a convenient location and a wide range of luxury amenities. Townhomes in the 190-home community offer an array of standard high-end amenities including gourmet kitchens, finished loft spaces, gas fireplaces and convenient two-car garages. Three-bedroom, 2.5-bath designs are available, ranging from 1,844 to 2,342 square feet of living space. Optional upgrades include hardwood floors, granite countertops, Whirlpool tubs and four different appliance packages. Basements are available in some homes. Homes are available for both immediate-occupancy and longer-term purchases with spring and summer closing dates. Some premium home sites on wooded lots will be available in the next phase. With a 7,500 square-foot clubhouse right in the heart of the community, residents enjoy daily recreation and group activities. The clubhouse includes a grand salon, entertaining kitchen, sunroom, flat-screen TVs, game and card room, library, billiards room and a state-of-the-art fitness center. An outdoor heated pool, putting green and bocce courts provide hours of additional entertainment. Residents also enjoy guest speaker presentations, day trips and other forms of organized recreation. Evening activities are often held to accommodate working residents. A residents’ committee organizes many of the activities and is always looking to make adjustments to the schedule, based on resident feedback. Regularly occurring events include golf outings, poolside barbecues and parties. Fit and Trim classes, Yoga and other exercise and wellness classes are some of the community’s popular, regularly-held programs. The Pointe at Turnbury’s location near several highways and mass-transportation options is ideal for working residents as well as those who are looking to spend some of their free time in nearby cultural centers. The shops, restaurants and theatres of downtown Princeton are just a ten-minute drive away, while New York City and Philadelphia are both about an hour away by train via the Princeton Junction train station. For more information or to schedule a visit, please call 609-799-0459 or visit www.millenniumhomes.com. The community’s Information Center, located at 108 Schalks Crossing Road in Monmouth Junction, NJ, open daily from 11 a.m. to 5 p.m.
From Northern New Jersey: N.J. Turnpike Exit 9 and follow signs for Route 1 S. Follow Rte. 1 S for 12 miles to jug-handle for Ridge Road. At first light turn right onto Schalks Crossing Road. Entrance on right. Proceed through gatehouse and follow signs to Sales Center and model homes. From Southern New Jersey & Philadelphia. Area: I-95 N or I-295 N to Route 1 N. At Quaker Bridge Mall proceed 7.2 miles on Route 1 N. Right onto Ridge Road, exit right toward Monmouth Junction. Proceed 0.2 miles and turn right onto Schalks Crossing Road. Entrance on right. Proceed through gatehouse and follow signs to Sales Center and model homes.